In her former Bay Area neighborhood, Maggie Pace was known simply as “the Knitting Lady.” Neighbors and fans of her knitting patterns, kits and yarns would drop by for sidewalk sales at her knitting store, Pick Up Sticks, or tune in to her segments on the PBS TV program “Knit and Crochet Now!” to emulate crafty know-how. These days, Pace is a little more incognito. She moved to Burlington in December 2010 when her husband got a job with Dealer.com. That new position went hand-in-hand with the couple’s decision to reevaluate their lives. She had to leave behind her business partner and the cofounder of Pick Up Sticks — her mother, Joan Benson, whom Pace credits with teaching her how to knit. Pace is a third-generation crafter; her grandmother ran a craft store in Michigan during the ’70s. Pace remembers knitting her first sweater when she was 9 or 10 years old. When she and her mother started Pick Up Sticks in 2003, Pace was five months pregnant with her second child and confined to bed rest — which gave her plenty of time to knit. After her son was born, she and Benson hit the road as business partners with her original designs. Pace’s primary revenue is now derived from selling downloadable knitting patterns, which she says has been a huge relief — and profitable. Despite knitting’s reputation as an occupation for fireside armchair-rocking grannies, it’s hip to knit these days, whether you’re 24 or 84. The resurgence has launched trends from boozy college knitting circles to “yarn bombing,” an art form that became popular a couple of years ago in urban centers. Anonymous yarn bombers decorated everything from bike racks to trees to public art, giving knitting new street cred. The iconic statue of Rocky Balboa at the foot of the Philadelphia Museum of Art was adorned with a cozy, bright-pink sweater reading “Go See the Art” last April; the Wall Street bull received similar treatment. In Burlington last year, the deer sculptures outside city hall were briefly clad in colorful leg warmers. “It’s an ancient craft, but knitters are some of the most computer-literate people on the planet, and are often the computer-programmer-y type,” Pace says. 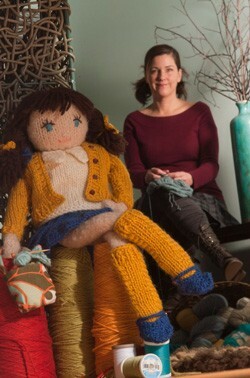 She’s a big fan of ravelry.com, an online community forum for knitters and crocheters. Pace doesn’t just knit; she’s also known for felting — the process of washing a knitted creation in very hot water to shrink the fibers together — and has written two books on the topic. Felting requires a 100 percent wool yarn, so Pace, a self-described “big-city girl,” says she plans to don her muck boots and learn more about the natural fibers still on the hoof on Vermont hillsides. While the web business model works well for her, Pace also wants to get involved in the fiber-arts scene in Vermont.